Obryn the Bold, the second member of my version of Steelheart's Champions. 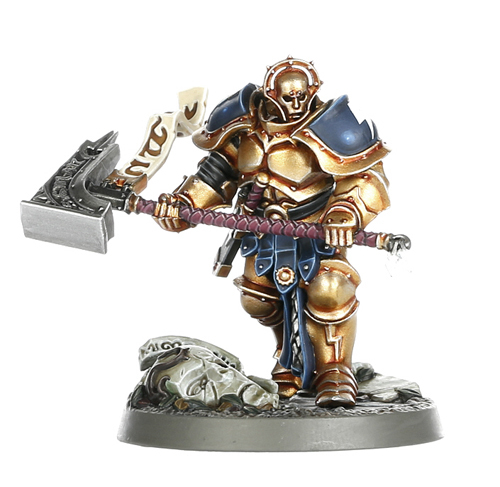 He is a beefy fellow wielding a two-handed hammer. 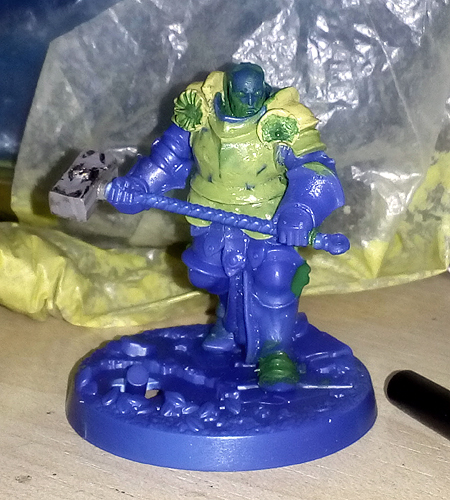 Same as with Angharad, I gave him an extensive armour makeover and a worn-out look with the paintjob. The original model, for comparison. Again, huge shoulder pads and weapon got replaced with something more reasonable. I also wanted him to have a full breastplate, so I resculpted that part. 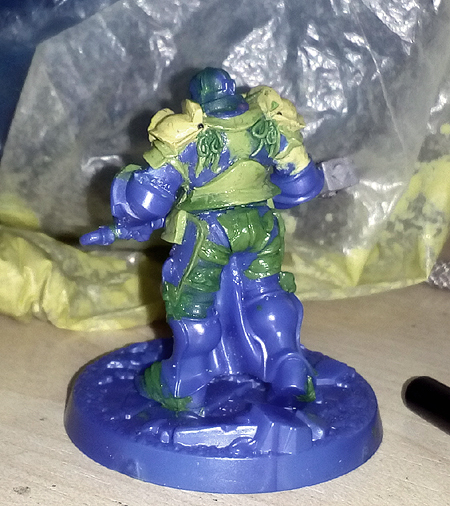 The blue parts are the original mini, the grey is other bits and the green/yellow are putty. In the meantime, I've played my first game of Shadespire. I'm happy to say I like the game, so the warband will not sit unused for sure. Angharad and Obryn. Only one member left to do - the leader. I've been asked a few times for a tutorial for this weathered armour. I just want to say haven't forgotten; it will appear here soon. Beautiful work. He looks like he's just strode out of a Bruegel painting. This looks fantastic! I love how you toned the model down. The smaller hammer looks so so much better. Smashing work Ana, best kind of conversion for this game, immediately recognisable but so characterful and unique. A real masterclass. He looks brutal and much more in keeping with his back story now! Amazing yet again! And after my comment on the last post I started to mull over ideas for what I'd probably do. One of the things I was thinking about was making open mouthed helms like Mordred from Excalibur and then I see this post and you've gone and done it with your latest creation lol. But I'm seeing it as proof positive that it looks very nice. I've been immersing myself in inspirational images of decorative Renaissance and Gothic plate. Just trying to fuel the imagination somewhat. I'm really tempted to go to the Royal Armouries for a little day out and soak up some more. I really like the way you've "tones down" the model by making the armour simpler and the weapon less cartoony. I find that some of the AoS models look too World of Warcrafty - it's surprising how giving him a smaller hammer actually makes him seem all the more brutal. Very nice indeed! Another superb conversion and paintwork! It's also nice to see that someone else had the idea to use the helmet tops of the Brettonian/Empire knights as scenic statuettes. A truely great conversion, is like made to pe for the paintjob - which it probably is. Did you sanded the scalearmour down on the jupon. I can't wait to see the last one. Wow Ana! You've made some silly looking models look bloody good. Wish GW had sculpted the originals like your version, I'd snapped them up myself. Looking forward to that tutorial! @Stygianheart - you really should. Photos and artwork are great, but nothing beats actually seeing the armour in front of you.